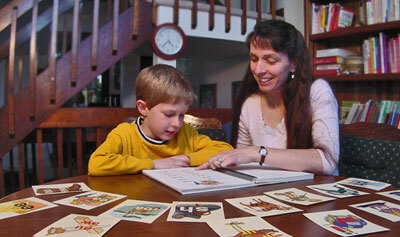 My tutoring instructions serve as lesson plans for children that are struggling with reading and writing. I call these daily lesson plans with my parents in consultations. For your convenience, these lesson plans have been broken down into two separate programs: Language Arts: Reading and Language Arts: Writing. Each program contains multiple lessons to assist the student. The Language Arts program is 2-part, 13-lesson structured daily lesson plan. These lesson plans originated in my resource room classes when I was teaching bright but struggling learners so that I could get a 2-year growth in a year. I have been using these exact plans for over 20 successful years. For typical kids, workbooks and worksheets facilitate growth but struggling learners need to learn how to think differently. No more worksheets, no more workbooks. Teach your child how to think with both sides of their brain, not into just data-driven lessons geared towards left brainers. If you begin with Language Arts: Reading Program, you can progress linearly through the programs through continue links at the bottom of the program’s page. It is recommended that you use the programs in their entirety, but should you choose, you can jump to any of the lessons within a program through the overview at the right.